Columbia designs Load Transfer Stations with safety and efficiency as top priorities. 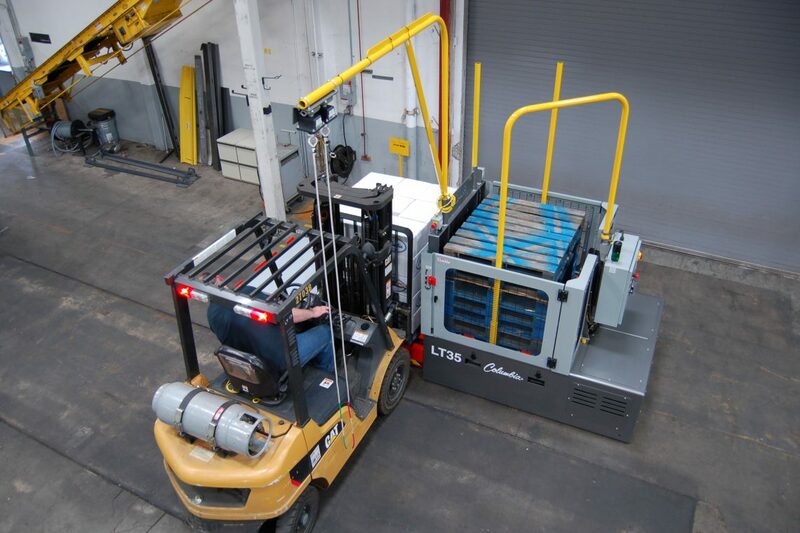 Each LTS model allows the operator to remain on the forklift during machine operation. 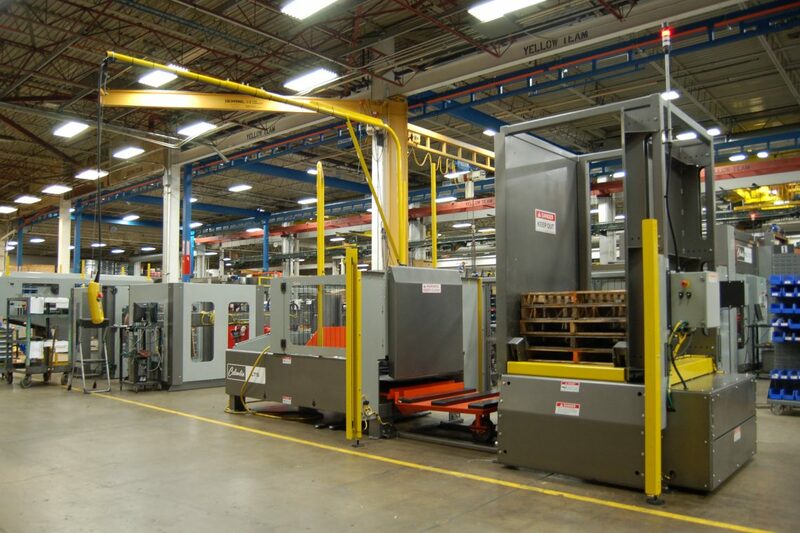 The cycle time of the transfer process is approximately 60 seconds and eliminates the need for manual pallet handling. Operated by the forklift driver, the Basic Load Transfer Station pallet transfer machine is made up of a frame, receiving deck and transfer plate. It can be set up to be loaded and unloaded from either side. 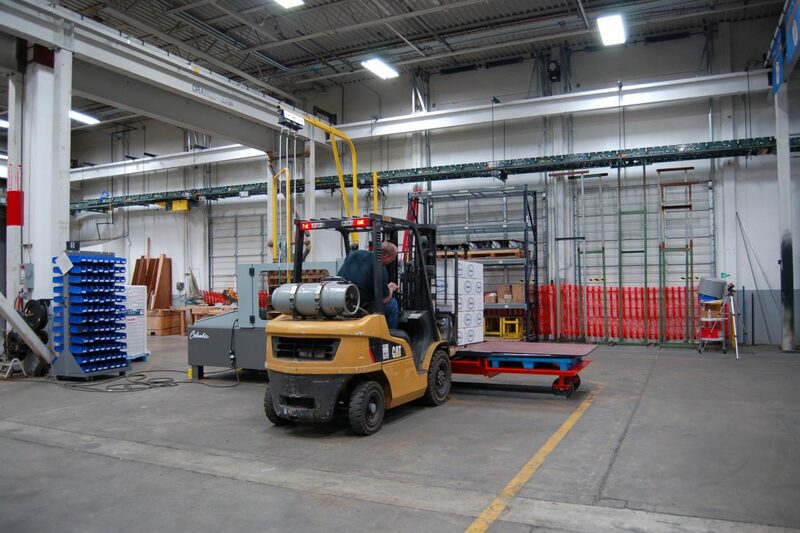 Driver places a unit load onto the receiving deck and returns with an empty GO TO pallet to hold under the transfer plate during the transfer process. The LTS has an internal upstacker with a 15 pallet storage capacity. LTS Station transfers cases from wood to CHEP pallet. The Load Transfer Station with Pallet Cart is a standard LTS with the addition of a pallet cart. The forklift driver places the GO TO pallet on the pallet cart, and then activates the machine via the pull cord to extend the receiving deck. The unit load is placed on the receiving deck and the driver activates the transfer process allowing the transfer to automatically complete. The LTS has an internal upstacker with a 15 pallet storage capacity. LTS with pallet cart (LTS-C) transferring glass vials from wood to plastic pallets. LTS with pallet cart (LTS-C) transferring from CHEP to plastic pallet. An economical alternative to load inverters, the LT35 Pallet-to-Pallet Load Transfer Station provides simple, effective product transfer between 48" x 40" pallet types. This transportable pallet transfer machine can operate at speeds up to five times faster than a traditional load inverter. 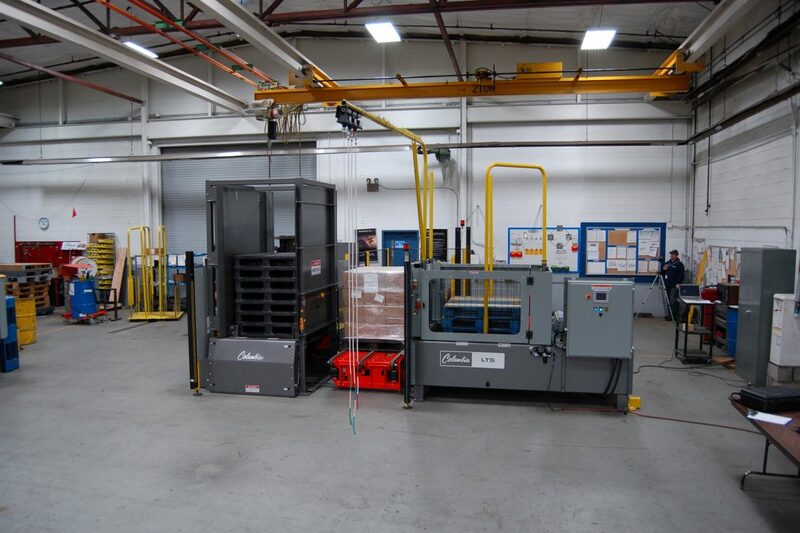 Included with the LT35 is a stacker that holds up to 15 pallets, eliminating the need for empty pallet handling. LT35 Transferring from CHEP pallet to a plastic pallet. The Load Transfer Station with Pallet Dispenser (LTS-PD) is comprised of a standard LTS, pallet cart and side load pallet dispenser. 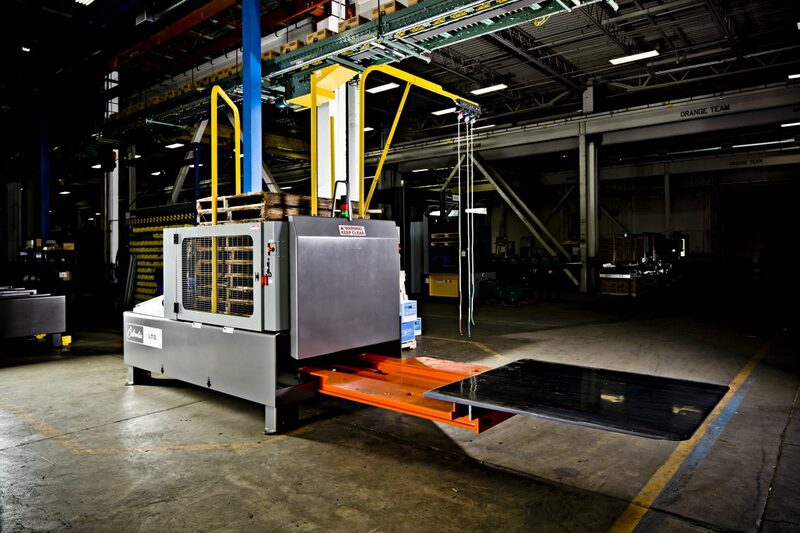 After the forklift places the unit load, this model automatically removes the GO FROM pallet and replaces it with the GO TO pallet without the assistance of a forklift. The LTS has an internal upstacker with a 15 pallet storage capacity. Watch the LTS-PD automatically transfer a pallet load of cases from a wood pallet to plastic pallet. Watch the LTS with Pallet Dispenser automatically transfer a pallet load of cases from a wood pallet to CHEP pallet. The Load Transfer Station with Pallet Dispenser and Outfeed Cart (LTS-PD-OC) includes the LTS, a 3-strand chain pallet cart and pallet dispenser. The LTS-PD-OC operates in the same manner as the LTS-PD, with the added function of automatically discharging the transferred load away from the machine. The LTS has an internal upstacker with a 15 pallet storage capacity. Watch the LTS-PD-OC automatically transfer a pallet load of cases from a wood pallet to plastic pallet. Watch the LTS-PD-OC automatically transfer a pallet load of shrink wrapped drums from a CHEP pallet to plastic pallet. Watch the LTS-PD-OC automatically transfer a pallet load of shrink film rolls from a CHEP pallet to plastic pallet. A Fully Automatic LTS unit receives loads from an infeed conveyor, transfers the load from the GO FROM pallet to the GO TO pallet, stacks the GO FROM pallet into an external upstacker and automatically discharges the transferred load onto an outfeed conveyor. A fully automatic LTS transfers a super sack from a wood to plastic pallet. The fully automatic LTS transfers cases from a wood to plastic pallet. 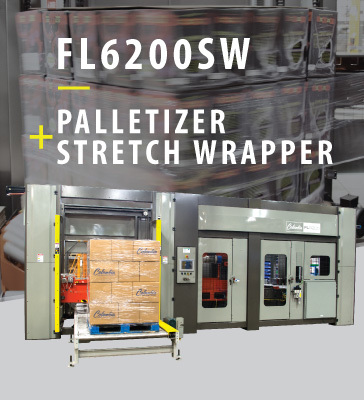 Columbia's dual load transfer system includes two load transfer stations with automatic pallet dispensers, power roller receiving decks, automatic outfeed carts, dual empty captive pallet picker, empty captive pallet upstacker, infeed conveyors and outfeed conveyors on the 703LS Pallet Dispensers. We design our Load Transfer Stations with safety and efficiency as our top priorities. Each of our LTS models allows the operator to stay in the forklift during machine operation, eliminating the need for manual pallet handling. WHAT IS A LOAD TRANSFER STATION? Load Transfer Stations are capable of transferring products that are packaged in cases, barrels, drums, bags and pails from one pallet to another including Plastic, Chep and GMA pallets in both receiving and shipping applications. 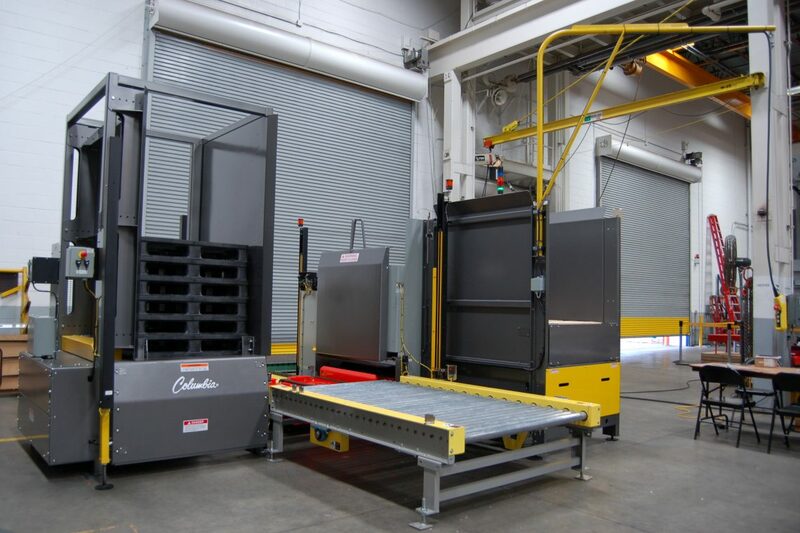 Columbia's Load Transfer Stations (LTS) optimizes your facility's lift truck productivity, reduces labor and shipping costs, prevents contamination from entering production areas AND prevents injuries. Load Transfer Stations have proven to be safer & faster than load inverters.